NETWORK FINALS: DANCING WITH THE STARS, THE VOICE and KEVIN CAN WAIT each gained 0.1 in final numbers. CABLE HIGHLIGHTS: The usual 3 networks were at the top of Monday cable. On VH1, LOVE & HIP-HOP rose a tenth to 1.52, HIP-HOP SQUARES was at 0.93/0.79 compared with last week’s 0.82/0.73, and THE BREAKS was down 0.03 to 0.47, with an 11PM BASKETBALL WIVES SHOWDOWN at 0.39. USA’s WWE telecast was at 1.31/1.24/1.19 compared to last week’s 1.46/1.44/1.38. On Discovery, a 2-hour STREET OUTLAWS returned at 0.94. ESPN continued to garner solid ratings with MAJOR LEAGUE BASEBALL at 0.79/0.63. The 2d part of ID’s CASEY ANTHONY miniseries was at 0.70, down 0.28 from Sunday’s installment. AMC’s BETTER CALL SAUL had a 0.70 season premiere, down 0.36 from the 2016 premiere, with after-show TALKING SAUL at 0.19. On Bravo, VANDERPUMP RULES was down 0.05 to 0.55, SOUTHERN CHARM ticked down to 0.36, and SWEET HOME OKLAHOMA rose 0.02 to 0.24. On TBS, AMERICAN DAD returned at 0.49, followed by the official season premiere of ANGIE TRIBECA at 0.31 (not on the chart because it was really a rerun, since the episode had run after an NCAA Tournament game). TNT’s NBA doubleheader featured Houston vs. Clippers at 0.49, and Washington vs. Detroit at 0.32. A&E’s BATES MOTEL edged up 0.02 to 0.42. 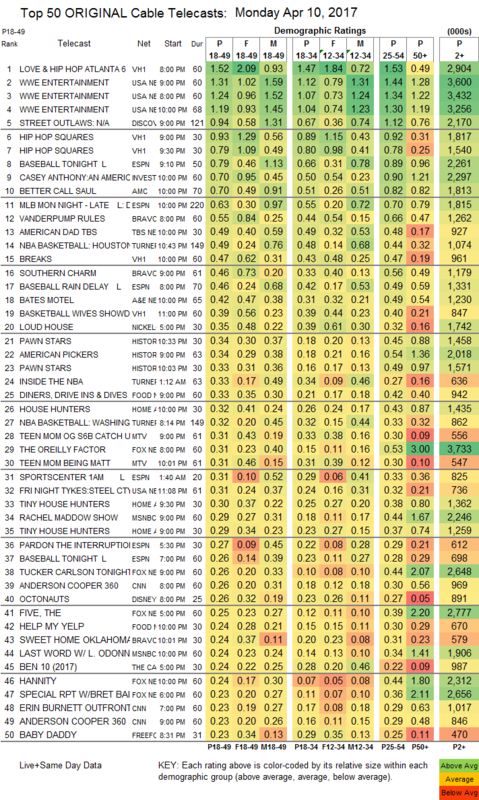 On History, PAWN STARS returned at 0.34/0.33, and AMERICAN PICKERS was at 0.34. Food Network’s DINERS, DRIVE-INS & DIVES was at 0.33, and HELP MY YELP premiered at 0.24. HGTV’s HOUSE HUNTERS was up a tick to 0.32, and TINY HOUSE HUNTERS was at 0.30/0.29, compared to last week’s 0.28. On MTV, TEEN MOM gained 0.03 to 0.31, with an after-show also at 0.31. 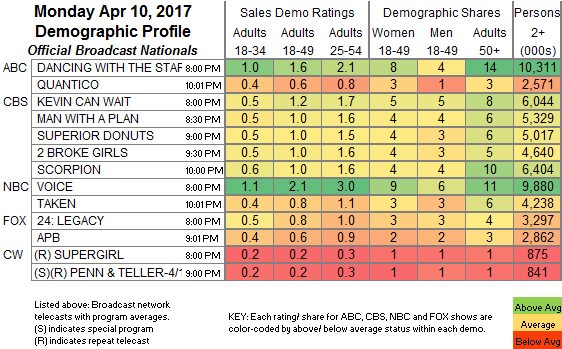 On Freeform, BABY DADDY climbed 0.06 to 0.23, YOUNG & HUNGRY fell 0.02 to 0.17, and THE TWINS was up 0.02 to 0.06.